Slater's 50/50 wasn't exactly on the way to anywhere, but I talked Happy Meal into taking a detour on the way from LA to Legoland with the promise of a milkshake. We found free parking in the strip mall lot where the large burger restaurant with full bar was located. Slater's 50/50 had an extensive beer menu, and it seemed that they had hired every friendly and attractive girl in Anaheim to work as a server or hostess. We were there to sample both the standard beef burger and the signature 50/50 Burger. The 50/50 Burger was half bacon and half beef. This sounded just interesting enough to be great. 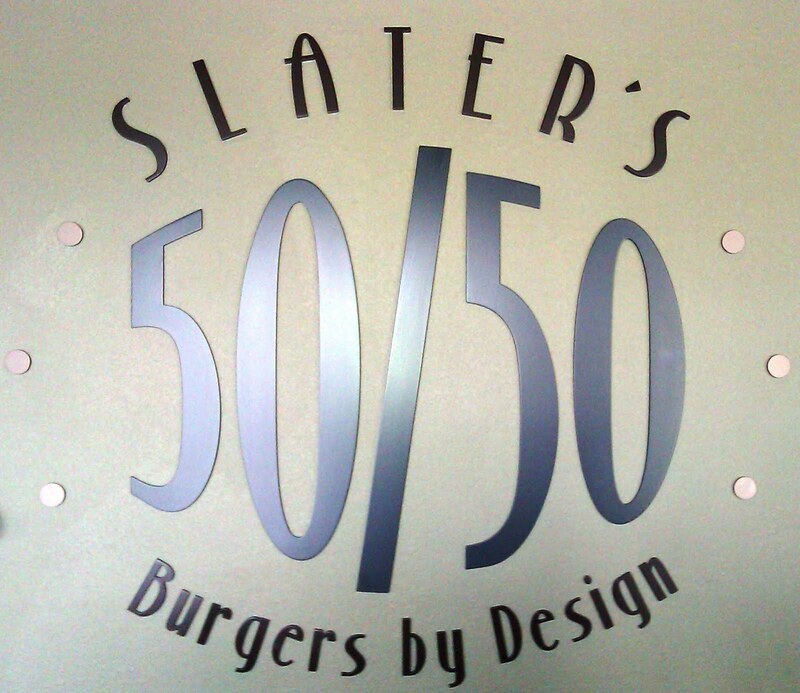 The concept at Slater's 50/50 was customization via a wide variety of high-quality ingredient choices. Meat, bun, cheese, sauce, and a single topping worked out to 165,984 basic burger combinations--by adding a single premium topping to the mix, the number of cheeseburger permutations soared to 2,323,776. I gave up trying to work out the numbers past this, since they offered up to 4 of the standard toppings with no additional charge. 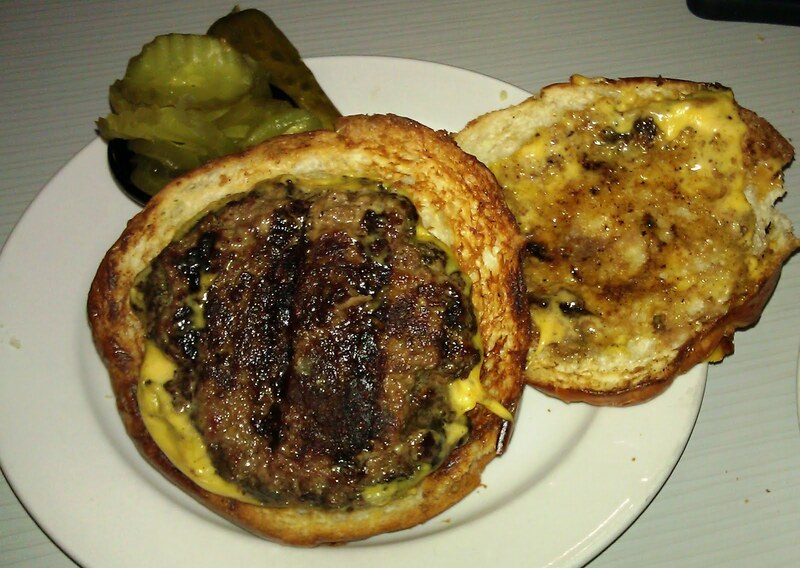 Slater's 50/50 also offered three patty sizes: 1/3 pound, 2/3 pound, and a full pound. Those were the post-cooking weights. We ordered a couple of 1/3 pound burgers ($8.85)--one beef and one 50/50--on white brioche buns, with American cheese, a side of fries, and a shake for the youngster. The fries (3.95) came out promptly, and the burgers came out in about 15 minutes. 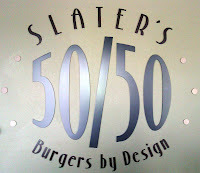 The Beef: According to the manager, Slater's 50/50 used Sterling Silver Sirloin as the beef for their burgers. The beef was ground fresh daily. Accordingly, I ordered the beef burger Med-Rare. This should have been fantastic, but it fell utterly flat. The burger tasted not even faintly of beef. It did taste mildly of iron and aging, but that was it. The texture of the beef was just fine. The beef burger patties were gently formed, so the beef patty was toothsome. 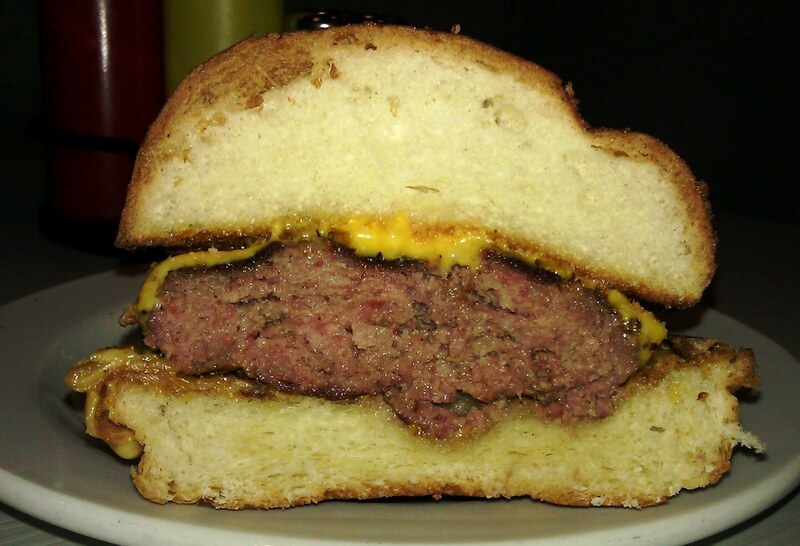 In the case of the 50/50 burger patty, the beef contributed bulk to the bacony puck. They had to cook the 50/50 patty to Well-Done since they made the patty with ground, raw bacon (try not to think about it too much), and that was the only level of doneness that made sense. This created, effectively, a really big sausage patty. It was chewy, and since it was cooked over a gas grill, it had some char on it. The char and bacon flavors did not go together--the char was highly unwelcome. The ridiculously high fat content in this version of the burger made it a bona fide gut bomb. It was heavy on the bacon flavor, but I discovered that I like my bacon crisp rather than ground up and cooked into a firm, chewy, pinkish-centered patty. The Seasoning: There was none. The beef was unseasoned before and after being formed into patties. The insipid beef was strongly in need of some help in the form of seasoning. On an awesome note, they did provide a shaker of bacon salt on every table. Bacon salt is one of the greatest inventions ever. You can't listen to bacon salt, but you can't eat an iPod. 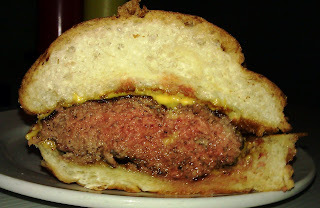 The Sear: Slater's 50/50 got a pretty good sear on both the Med-Rare standard beef patty and the Well-Done 50/50 patty. The sear was for naught in both cases. The beef patty was so bland that the sear only served to provide a shift in texture. The mild char was fine on the beef burger, but not good when applied to the bacon patty. That just tasted like burnt bacon. The Preparation: They had a great process at Slater's 50/50. The various meats were ground (medium) fresh daily and set aside. When an order was placed, the kitchen staff weighed out the ground meat and hand-formed the patty just before placing in on the cast iron grates of the gas-fired grill. The burgers were only turned once, and the grill was hot enough to get a solid sear on the patties. This was simply a great way to cook cheeseburgers. 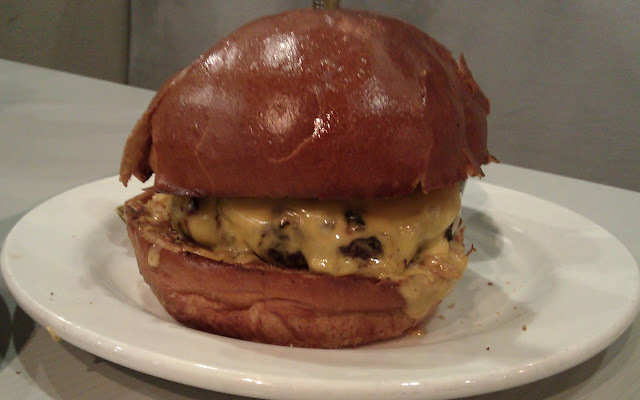 The Cheese: The American cheese was wonderfully melted over the burgers, and this fused the top buns to the patties. It was unfortunate that the competent cheese was utterly lost in the voluminous bun and the bland beef. In the case of the 50/50 Burger, the salty bacon and the bitter char neutralized the cheese's flavors. The Bun: The white brioche, like all of the bun choices at Slater's 50/50, was sourced locally. This bun was pleasantly yeasty and sweet. It was tender, fresh, and moist. Additionally, it was buttered and really nicely toasted on the griddle. This created a very satisfying crunch. My sole issue with the bun was that it was that the top was oiled, and this created an oily feel in the hand. The Meat To Bun Ratio: The big, pillowy brioche was simply far too large for the 1/3 pound burger. I did sample a few bites of each burger without the bottom bun--the ratio was perfect without the bottom bun. The brioche bun appeared to have been selected to handle the 2/3 pound patties. 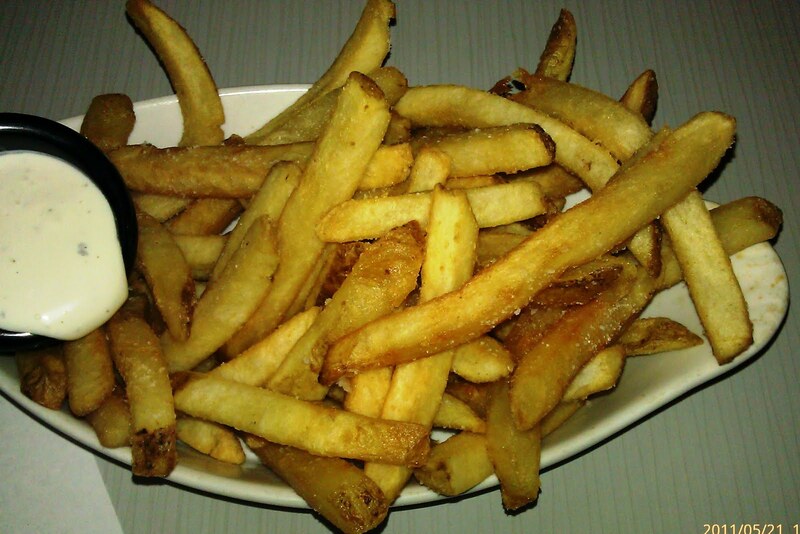 The Fries: The fries were of the peel-off, par-cooked, frozen, and bagged variety. They were also fantastic. 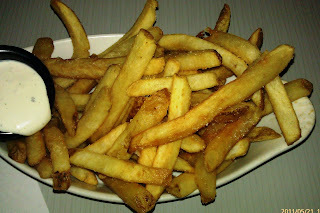 The fries were both perfectly cooked and perfectly salted. They were crisp and golden with wonderful creamy centers. I would have those fries again. Happy Meal strongly approved of the fries. The shake (Oreo) was a big hit with Happy Meal, as well. The Value: The value was on the weak side. $9.00 for a 1/3 pound burger was a little steep. In this case, due to the blandness of the burger beef, the cost of the burger was particularly pricey. I really, really wanted this to be an excellent cheeseburger. The ingredients were fresh and selected with care. The preparation, aside from the seasoning, was designed to turn out a world-class burger. Sadly, the perfection of the preparation and the resultant textures was nearly completely offset by the lack of flavor from the beef and seasoning. I'd like to think that this was an off day at Slater's 50/50. They had all of the difficult parts down pat! Burger Review : A brilliantly prepared but bland burger was served at Slater's 50/50. If toppings are your thing, then this might be your place. Don't you realize that ALL bacon is cooked? Curing is a form of cooking, you don't have to use heat to call it cooked. I made my own 50/50 burgers and cooked them medium rare with no issues. The do need a light seasoning to come out well, though. There are a couple of more exotic ways. Please note that the curing process provides exposure to none of those. To your point,the curing process does use or one more of the following: salt, smoke, and sugar. These kill off bacteria and create an environment with a low enough "
water activity" that bacteria die upon contact. That said, curing is a form of preservation. Pickles are also not cooked...they are pickled (preserved). In closing, I found the burgers unduly chewy and greasy, because the bacon was not cooked--this resulted in a fatty and chewy burger. I will say a prayer tonight for anyone who has accepted a dinner invitation from you.